So this morning I was finishing up a mix, and it’s been a really fun, different experience. See, I’ve had this Presonus StudioLive 16.0.2. digital mixer for a while, but I’ve only used it as a front-end interface for my studio. I’ve always mixed in-the-box. Well, I guess I got bored the other day and decided to mix this song through my mixer. It was more just for fun than “for serious,” but the mix was turning out so well I didn’t want to go back and re-mix it in-the-box. So I finished ‘er up, and I gotta say, it was awesome. One of the best things about the process was that it made me think more simply. It forced me to fit my mix into 16 channels. It made me choose which tracks to give their own channel on the mixer and which ones to submix together. It made me use the onboard EQ (only 3 bands with no “Q” control) and compressor (no individual attack and release settings). So it was definitely a hybrid approach, mostly mixed through the mixer, but SOME mixing (and automation) done in my software. Heck, I even whipped out some tape and labeled the tracks on my mixer! Will I mix my upcoming album this way? I’m not sure, but I love the idea of keeping things simple, of reaching for faders and knobs and working a bunch of tracks into a masterpiece. Next time you’re working on a song, try taking a very simple approach. Limit yourself to maybe one or two plugins, and use ’em over and over. Don’t let yourself get too distracted by the mixing that you miss the song. 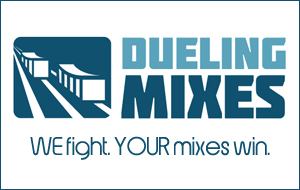 Oh…and did I mention that the song I mixed is actually next month’s song over at Dueling Mixes? and you’ll get to hear and see how I did my “hybrid” mix.